Vanilla is very shy, timid and cute. She has short blond hair, purple eyes, and pointy ears. She cries a lot (which attracts that boys) and she is very kind and gentle. She is the opposite of Chocolat and she has a very soft voice. Vanilla is also more conscientious. She doesn't get angry a lot (rarely) and her familiar is Blanca, the mouse (who gives good advice on how to win hearts, unlike Duke) and Vanilla is very babyish. She loves cute stuff and she is a good cook. She is smart as well. 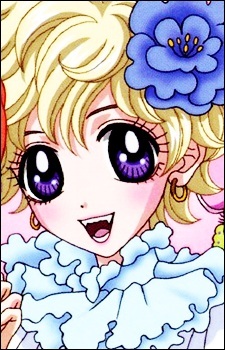 Vanilla is a very sweet girl and she is the daughter of Queen Candy. She is more popular in the human world and Vanilla also tries harder than Chocolat in becoming Queen. Her birthday is November 16. Halfway through the series, Vanilla becomes Ogre Princess, due to Pierre's trickery. Chocolat is able to save her. In the last volume of the manga she wins the right to be Queen, but refuses to take the crown. She finally accepts the crown because Chocolat is missing. But, in the anime, Vanilla gives the crown to Chocolat thinking that Chocolat is more suitable to be the Queen. She ends up with Woo in both the anime and the manga. Vanilla's name translates from French as "Better Vanilla".